How can I help you win more on Xbox Live Arcade? First I need to let you know a bit about myself. I'm a long time GoldenEye N64 player, and even more of a Perfect Dark N64 player. I didn't give up playing Perfect Dark like many. I continued to play hours and hours of multiplayer. My skills and knowledge of the game and Perfect Dark maps is accurate and reliable in 2009. I know Perfect Dark inside and out! Trust me. I was thrilled at news of Perfect Dark on Xbox Live Arcade. I can put my skills and knowledge to use! I can help you on your Xbox Live skills! So, you want to dominate on Xbox Live. Perfect Dark is going to be the biggest game on Xbox Live Arcade so you should start refreshing your knowledge of Perfect Dark maps now! It's been out for a while now so that initial rush for XBLA Perfect Dark has subsided a bit. That shouldn't discourage you though. Join up with friends and play PD online! I will add to these Perfect Dark maps tricks and tips on a regular basis. I will give you the best camping spots, the most popular areas to find kills, where not to go on Perfect Dark maps and every other trick that I can think of. I can tell you the best Perfect Dark maps which you need to learn more than the others. I will be posting walkthrough Perfect Dark maps videos also. 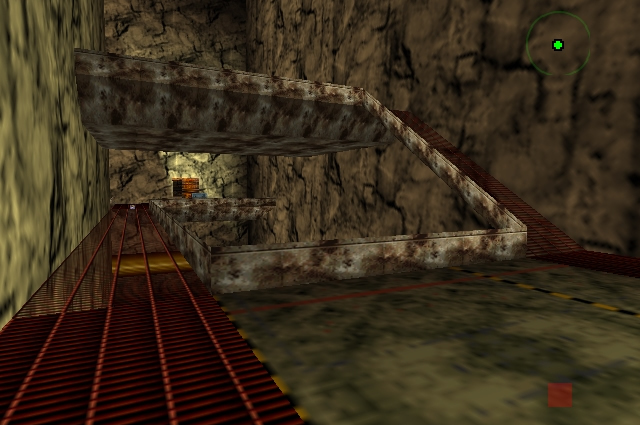 Nothing is better than seeing the layouts because likely it's been a while since you last played and you need to relearn the Perfect Dark maps just like everyone else. Remember Skedar? How about Grid map with the glass floor? Villa? 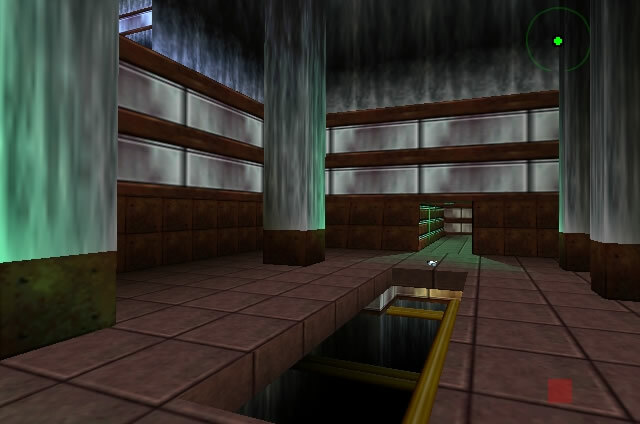 I'm sure these Perfect Dark maps all bring some memories to you. Get ready. Perfect Dark maps resources will be coming shortly. My goal? Help you win Xbox Live games. You want to rule the Xbox Live Arcade Leaderboards? If you do, then you need to bookmark my website now. Thanks for visiting! The key to playing Perfect Dark on XBLA is realizing or adjusting to the fact that it's single screen. You can camp! There are key choke points in every Perfect Dark map. The high traffic zones in which you can really rack up the kills. Generally the high traffic zones are simply the spots where the best weapons are. Since XBLA Perfect Dark uses the default settings, it's pretty easy to know those weapon locations. Those hot spots need to be approached with caution and I would recommend that you do so after getting a shield and a good weapon. Running into a hot zone without a shield and or good weapon means a quick death. Not the way to win! The other key tip which applies to all the Perfect Dark maps is to stay on the higher ground. Get to the top level and get a birds eye view. It's key. If you are at the bottom of a level it's very hard to see above and see who is lining you up with a rocket etc. It's a basic combat strategy. Those on the higher ground have the best chance for success. Think about G5 and the higher sections of that map. It's easy to drop down on a ramp and make a kill from behind. 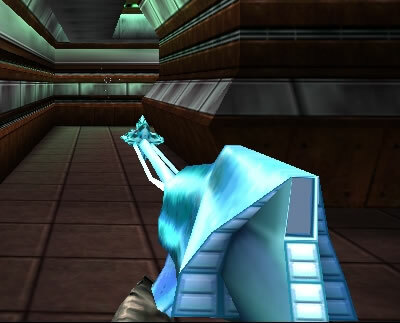 The dropping down to kill an unsuspecting opponent is a huge key for winning more at Perfect Dark online. In general, because of the single screen, stealth is simply more important. That means changing your style from what might have won you more games on the Nintendo 64 version of Perfect Dark. You can take your time now! Don't run out into the open! 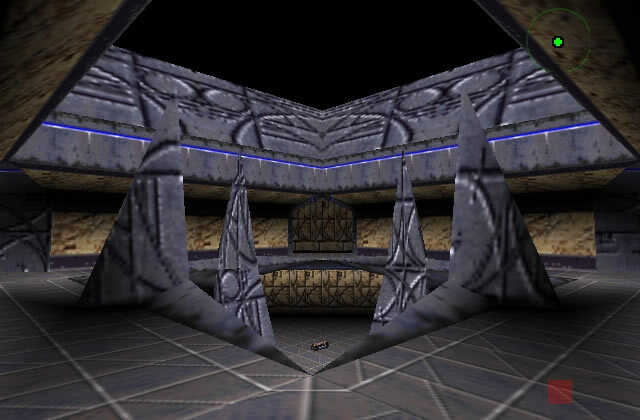 The photo above is very much a central or high kill count area of the Skedar Perfect Dark map. You could say don't come near here if you are unprepared. In other words bring the best weapons and if there is armor, make sure you have it on! Being higher, or on the ramps above is simply the best option. You can easily get pinned down below. The good thing is if you have a dark character and aren't playing with radar, then you can head into the shadows and hopefully make a quick exit. This is a big level and when you're playing head to head on XBLA a win may amount to only getting a couple kills. That means take your time when the game starts! The lower level sees little if no action. To get the hot zones where you will find lots of players you need to be in the diamond room aka square room. You know the one. It is small, has four entry/exit points and is essentially the central location for the map. Just make sure you are fully armed and have your shield on when approaching this area. Because of the vast open areas it can be easy to camp on a high position and take out an opponent without them even knowing. Just make sure that when you make the kill you are shooting the player in the back. If you're spending time in the big open areas in the back sections, you aren't going to rack up many kills. To make kills you need to be in the high traffic areas and the areas where the best weapons are. If you are taking damage from somebody from the window above, take cover to the far right in the photo behind the rows of pillars. This is an example of "running the gauntlet" if you are being bombarded by a hail of grenades being launched from a devastator or superdragon. Pipes is likely not everyones favorite map. Lots of areas to fall from which can be a irretation. See that area below? Those pipes? Stay away from there! Ultimately you want to spend the most time at the top section of the level. You have 2 entrances to control, but you have that 3rd opening which you can use for offense and at the same time will have very little to be worried about. Sure if you're in a game with explosives you may have concerns, but your upper position is dominant. You will win over a player lofting explosives from below. It's really the upper section that is the key to victory. The lower level sees the least traffic and if you're spending a lot of time down there you will certainly not winning many games. Avoid the area with all the ramps and the lift. You are vulnerable on the lift and walking around on the ramps makes you an easy target for the player who is above you waiting for an easy kill. If you're playing Ravine on Perfect Dark Xbox Live Arcade with the single screen, be extra cautious. You are a sitting duck if you're walking on the lower areas. An explosive that can be tossed down from above means carnage in a big way. Always be looking up on the ledges to look for a player camping out looking for kills from above. Ravine is Perect Dark map that we have always enjoyed. With the right weapon settings, it's a classic. This level is perfect for Slayers or a setting of all sniper rifles on on-hit-kill mode. Xbox Live and the single screen multiplayer really opens up some real amazing possibilities. Tips for playing Ravine? Just like every other map I will always recommend the higher ground. Ravine isn't as critical however. In fact the top part of Ravine is a good place to go if you want to see little or no action. Make sure you don't get cut off on the lower ends of the level with the lift. Think of that area as a dead zone. You will get cutoff and killed in most instances. The lift is very unrealiable and you will be relying on luck to get out of the hot zone down there. Did I mention Ravine is idea for Devastators? But a good place to be is that mid level section which you see in the photo above. It's safe there and you have some easy kills as people come running down the passage into the open. If you can control this section of the Ravine, you stand a good chance of dominating. You can transfer from ramp to ramp if you're careful. From this position in the photo, you can drop down to the lower ramp. This is especially good for a surpise attack or if you've just see a player walk past you. 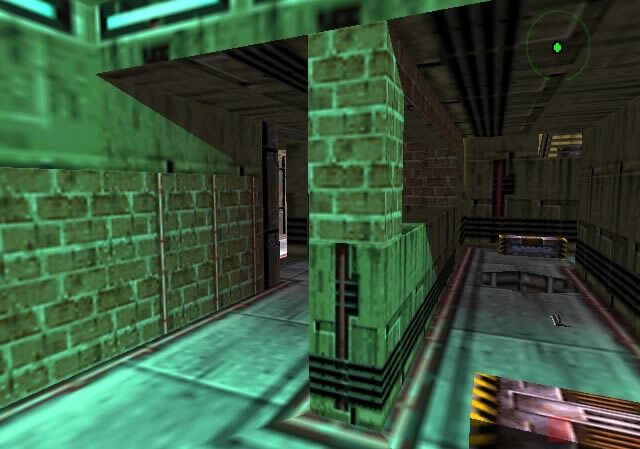 The G5 Building is a favorite map of mine in Perfect Dark. Yes falling to death is bogus, but overall this map has some great multiplayer features. This is definitely a fast pace Perfect Dark multiplayer map! This area as shown in the photo is a real hot zone. It's the place where you most likely want to be around. There is quick access to a few high traffic zones and plus you have the wall to the left which means it's a relatively safe walkway to use or stand on while picking off opponents. 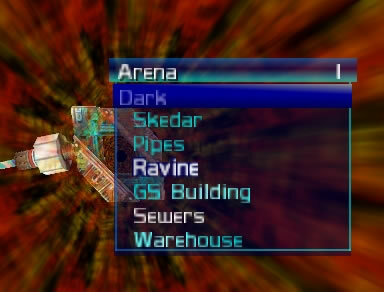 Even experienced Perfect Dark multiplayer vets will at time find the passages in Sewers to be confusing. I do! People may not always like the laptop gun, but it's an enjoyable weapon to play with in Sewers. Because it's a big map, action can be slow. The lower level is the best bet in a multiplayer match to find opponents. It's also the least confusing section of the map! There are plenty of lifts for easier access to upper areas should you want to vacate the lowest level of the map. The only ramp out of the lower level is a high traffic zone so you should always be concentrating on getting to that area. Ensure that you have decent weapons when doing so. You'll need the help. How to master Perfect Dark weapons. Win more on Xbox Live Arcade. When Microsoft announced Perfect Dark on Xbox Live Arcade, I was juiced. I'm a long time GoldenEye N64 player. I played an equal amount of Perfect Dark multiplayer over the years. I played longer and more than most people. I have learned Perfect Dark to the point that I will help you win more. Guaranteed. Perfect Dark is coming to XBLA in the Winter of 2009, so there is time to start learning. I'm not efficient with the Xbox 360 joystick, so I'm not expecting to dominate on Xbox Live Arcade. From the technical standpoint, I will not and cannot be outsmarted. I will break down Perfect Dark multiplayer and help you win! You will have to trust in my skills, knowledge and experience. I can and do dominate Perfect Dark multiplayer using the traditional controller. I will share tips that will help you win because I know the in's and out's of PD multiplayer better than most people on the planet. I have played and continue to play this game for years and years. Even with the new games, myself and my small group of friend continued with Perfect Dark deathmatch. I just don't think you will find a more reliable source of tips and tricks regarding Perfect Dark N64. For now you will just have to trust me on that one! Let's discuss the most important Perfect Dark multiplayer weapons. I will list these in the order of importance. In other words, if you're playing on Xbox Live Arcade, you want to get these weapons in your hands. If you don't, you will lose. One golden rule of Perfect Dark: Always go for the headshot! Cheap? Perhaps. It's only cheap when you are getting killed constantly by an opponent or opponents with a Far-Sight. It's not cheap if you're the one doing the spanking with it. If it's on the map, you need to find it and forget about everything else. You don't stand a chance if your opponent has some decent skills. Use B function, which will slow track the scope to the nearest opponent. I will keep a couple tricks to myself, but just make sure you keep moving if you can't locate a victim. Hard to argue with this one. With so many bullets in a clip, you really can't lose. Cloaking is the secondary function which is cool, but a bit confusing. You will run through your ammo while cloaked like water running from a tap. Why cloak when you can just spray bullets and pwn? Not the most deadly power in the bullets, but a couple headshots (about .4534556456 seconds) and you make the kill. Not a big clip so make your shots count. If somebody is silly enough to take you on from a distance, they lose. Double crouch is critical for accuracy. Aim for the head. One headshot will kill your opponent. Try burst fire also. The reload is painful, so expect to strafe like hell during a battle. Just aim high if you are in close range. Headshot is key. Secondary function is decent as a threat detector. Actually, it's the best secondary function if you are playing with silly explosive type weaponry like grenades or mines. Simply said, you want doubles of these. In addition, use the B function for super charge shot. Sure you will have less shots before reloading, however if you get the right location, your opponent will be dead. Get the head, and they end up dead! It's a fun weapon even though the fairness isn't part of the fun. If you are in a match containing a laptop, it's key that you get one in your hands. It's deadly when used as a traditional shooting gun, but you want to first defend the location where you picked it up. Move away to allow the laptop to regenerate. During this time think about where you want to throw your laptop. Ensure you have full ammo, throw it via secondary function and pick up the newly regenerated laptop. Move to other areas, but it's not a smart idea to venture too far away from your fortified position. Only take risks if you are losing and there isn't much time left in the match. A last resort weapon. If you don't have doubles, your best strategy is to run from opponents. It's not quite on the level of the GoldenEye Klobb, but it's not far off. If you don't know yet, the secondary function for the CMP150 is a follow lock-on which is a fancy way of saying super duper auto aim. You need to lineup and opponent with the cross hairs which will trigger a lock. This is indicated by a yellow halo around that opponent. At that point, fire away and watch your opponent die in seconds. All you do is pull the trigger! Sure a lockon isn't overly skillful but if you want to win then use the weapons to the best of their abilities. I strongly recommend dual CMP150's when ever possible. If you can get that lockon immediately you are rarely going to lose. Just ensure you have duals and full clips when you are not engaged in a battle. Short burst may be necessary if an opponent is running, weaving, dropping down or going upwards. In terms of enjoyment, I put the CMP150 at or near the top of my favorite weapon. Lockon auto aim > most other bullet firing weapons in Perfect Dark. Who am I? A big fan of GoldenEye and Perfect Dark for the N64. I consider myself a veteran player at both games, especially Perfect Dark. With PD XBLA, I'm going to write up some Perfect Dark tips. I will help you win more I promise. If nothing else I hope this information will help refresh your Perfect Dark knowledge if it's been a while since you last played. It's been a while since you last played I bet. That's fine, there is plenty of time to remember. The key difference plays a major role in strategy and approach. It's called single screen multiplayer vs. split screen multiplayer. It requires a change in thought process. Character selection is an important strategy element in Xbox Live Perfect Dark. Yes in some levels like Villa, it won't matter, but overall darker is better. Tan is a great color character in levels like G5 Building. There are instances where your color choice in character will allow you to hang back, wait, and evade in battles by sticking in the dark areas of the levels. The other main difference between Xbox Live Arcade PD and N64 PD is that you are going to see the default weapon settings when using Xbox Live matchmaking. Is this lame? Some say so. I still enjoy it even though we NEVER used the defaults when playing Nintendo 64 Perfect Dark. The key is to know the lay of the land. In other words, at least have an idea where the shields are and the power weapons are. If you don't know these keys, then you will never dominate. In fact you will get smashed badly against a player with simply better knowledge of the layout. That's not cool. You are going to need some time adapting to a new controller also. Is there a perfect fit? Not exactly. Perfect Dark was created with the N64 controller in mind so remember that. Microsoft has brought in a few new variations and advanced options so you can get your own settings as good as possible. It's almost an endless amount of sensitivity settings and configs. 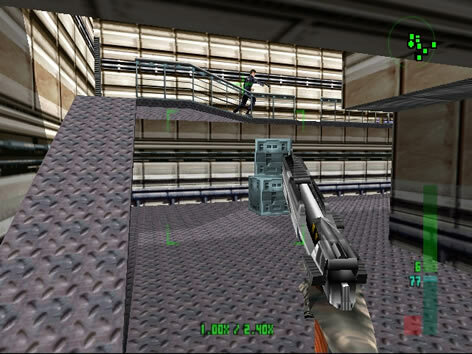 A GoldenEye classic Complex match is never a bad idea. With the matchmaking in Perfect Dark XBLA you are going to see a lot of head to head matches. Want adrenaline? Head to head provides that in spades. It can be gut wrenching especially if you're against a top player. Key thing here is get the top weapons and fast. If you die early, make it hard for the other player. Hide, duck, and stealth until you can arm properly and get the shield. If you respawn and think the other player hasn't restocked, then you are going to lose often. Assume the other player is a good player and as you're respawning they are getting to the best single wield or the best dual wielding weapons in addition to getting a shield. A smart player will get to the choke points after making a kill or get to the areas where the best weapons are. Sooner or later a player will come to get a shield or a top weapon on the map. The second you know what map is being played, have a small strategy in mind about what you grab first depending on where you spawn. Don't give away your position! Perfect Dark and the disarm function. Remember the dizzy spell? Always worth a laugh. Not. Anyways, disarm will be more important on Xbox Live Arcade simply because there will be more players running around. I don't know about single screen or split screen, but if you can't see your opponents screen then disarm just became a much more important skill than the original Perfect Dark for the N64. If you've spent time in Perfect Dark multiplayer with friends, I'm sure you know some of the juicy camping spots. The biggest advantage now is that you will probably be playing on XBLA with single screen multiplayer. Now nobody can see where you're camping! Is camping cheap? I suppose only if you are the one who is dying and losing. The fact is camping is only effective if players are not playing smart. Round a corner without any consideration and blam you're dead. The point is be aware of dead ends or popular camping spots. You can use those spots for your own camping or you simply can avoid them. Perhaps clear out a known camping spot with a well placed laptop first before proceeding around a corner. Pictures of the popular camping spots coming up soon! You need to be active to win in Perfect Dark multiplayer. Xbox Live Arcade will be no different. 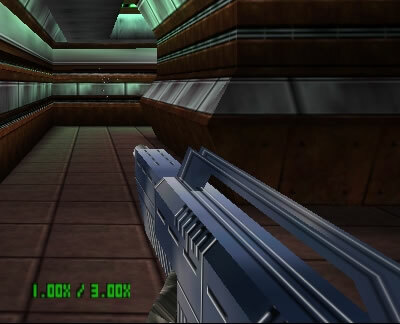 If you are used to playing Perfect Dark on your Nintendo 64 then you could always see where the action was happening. It's time to start thinking differently. Think single screen multiplayer on XBLA. You need to know where to go and what areas of the map to dominate. If you know these high traffic zones, you can rack up massive kill counts. Remember humans are not bots. If you are an expert playing single screen multiplayer against bots on the original Perfect Dark on your Nintendo 64, that experience will be of little help to you. I know human nature, not bot nature on the Perfect Dark multiplayer maps. I'm here to help you! Pictures of the high traffic zones coming up soon! Two Guns Beats One Gun - Duh! Sounds simple right? Holding two guns at one time vs. holding one gun. Who wins? All things being remotely equal the dual wielding player wins in those exchanges. The point here is that in a head to head Perfect Dark game, be sneaky until you get dual weapons or a top weapon. If not, get ready to die fast and die often. You may only have that initial game spawn to get a best weapon or duals so act quickly as a game starts. Okay, a refreshed for Perfect Dark maps and weapon placements. The lower the number, say weapon slot 1, there are lots on the map. As the slot number increases, there are fewer weapon placements. 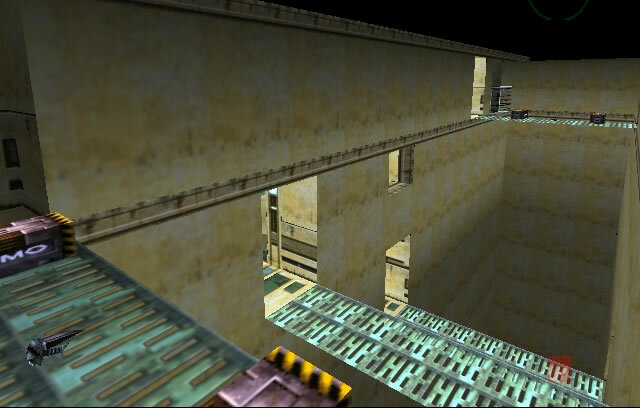 In slot 5 and 6 there are usually only 1 location no the entire Perfect Dark map. If you are playing the default Xbox Live matchmaking, you are going to be seeing the standard weapon sets which you probably never ever played. If you're in a head to head situation, you're toast if you don't know where the best weapon is on the map. You can either learn ahead of time, or you can learn out of frustration of losing on Xbox Live all the time. Yes, shield locations are pretty key to know also!